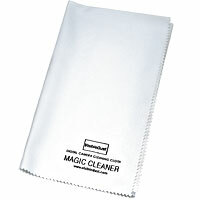 Magic Cleaner — cloths for cleaning camera optics lenses, viewfinders. Produced from ultra fine 0.1 denier microfibers for optimum softness and density VisibleDust Magic Cleaner cloths are perfect for cleaning camera optics such as lenses and viewfinders. These cloths absorb dirt, grease and moisture more effectively than natural chamois leather, leaving a spot-free finish without abrasions. It is recommended to use Magic Cleaner in conjunction with Lens Clean™ for a comprehensive optical surface cleaning.